Whether it’s Rome, Paris, Hong Kong or New York – we all have that one city lodged in the back of our mind that we would just love to visit or return to. Though real life often gets in the way, one Japanese company is now offering a tangible solution to get part of that city into your home. While we all have photos or souvenirs, 3D printing specialists iJet is now selling amazing 3D printed scaled dioramas of cities, enabling you to return to that one neighborhood of Tokyo or Hiroshima again and again. And these aren’t just cheap images of what Tokyo approximately looks like, either. Instead, iJet teamed up with Japanese mapping specialists Zenrin to create a new line of cityscapes that are so detailed they could easily hang in an art gallery or museum. Most importantly, several neighborhoods can be selected, as you obviously want to look at that one defining piece of architecture. As you can see above, the Tokyo Tower is one of the landmarks selected for their examples, while the iconic Jingsu Stadium, home to baseball legends and history, is another. Their models of Hiroshima, meanwhile, show the Hiroshima Peace Memorial, known as the Atomic Bomb Dome – where you can even see models of the city before and after the drop of the bomb in 1945. Most importantly, the company says that they are willing to accept requests to bring any other location alive as a 3D printed model. So if you want to see your favorite spot, city or even your own neighborhood inside a beautiful photo frame, you can. It’s a very remarkable and touching approach to memories, dreams and architecture, and is especially impressive for the very high level of quality that these bird’s-eye views have. If you knew someone who lived there, you could definitely recognize their home. To achieve that quality, iJet teamed up with prominent Japanese mapping experts Zenrin, to ensure that all the roads, highways and buildings are all accurate. And Zenrin is more than capable of providing that accuracy, as they are experts at mapping major Japanese cities, for applications in architecture simulation, construction, civil engineering, driving simulation and game development. 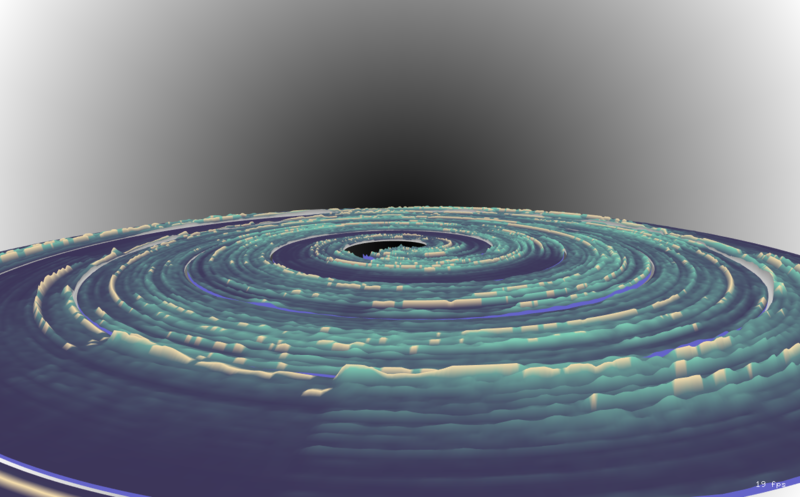 They are also aiming to expand their 3D printable data, as this is an expanding market. They are even actually offering a 3D city model to game developers, free of charge, as part of their ‘Zenrin City Asset series’. The data for that city, which can be seen below, was based on the Akihabara in Tokyo – Japan’s foremost area for everything anime and manga. “Since the data is based on the actual streets, you can reproduce the realistic city as a virtual space in the game,” they say. Their hope is that this data will give a boost to creative activities. But these 3D printed city dioramas by iJet are far more touching and meaningful. All have been 3D printed using Flashforge 3D printing solutions, and several different 3D printed models are already available through the iJet website. Prices depend on size, which a 10-centimetre (3.9-inch) square model costing 9,800 yen (US$87), while the largest 30-centimeetre model costs 140,000 yen (US$ 1,250). Scale can also be varied, especially with an eye on corporate orders from local governments and the construction industry. To make them as presentable as possible, all come in a very stylish frame. Time, the elusive measurement of entropy that ticks away our moments until death (and possible rebirth?). That measurement has mutated from simple sundials to complex smartwatches without its actual meaning ever being any more salient. What up with that? 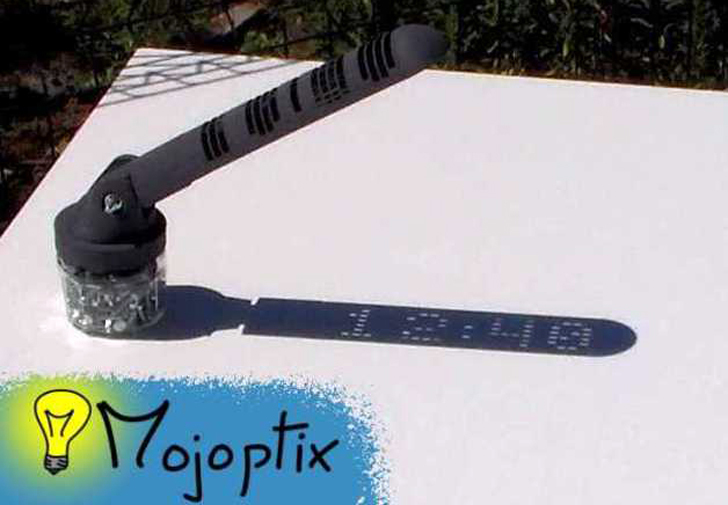 For those of you too busy for pontificating on the nature of time, but with enough time to 3D print a device for its measurement, consider the 3D printed Digital Sundial from French design studio Mojoptix. Now, you can be equally tech savvy and troglodytic with a single tool. Before you get ahead of yourself and burn the clocks in your home (and your smartphone), the sundial only actually covers the times between 10:00 am and 4:00 pm, updating every 20 minutes. To set the time, the user simply rotates the sundial’s gnomon. This makes it possible to adjust the time for time zones or Daylight Savings Time. For those with access to a 3D printer, the files are available for free download from Thingiverse. For everyone else, Mojoptix will make one for you for about $80. For those of you longing to see and touch your favorite tunes, Blair Neal, an artist and creative technologist based in New York is using 3D modeling to explore the relationship between sound and image. 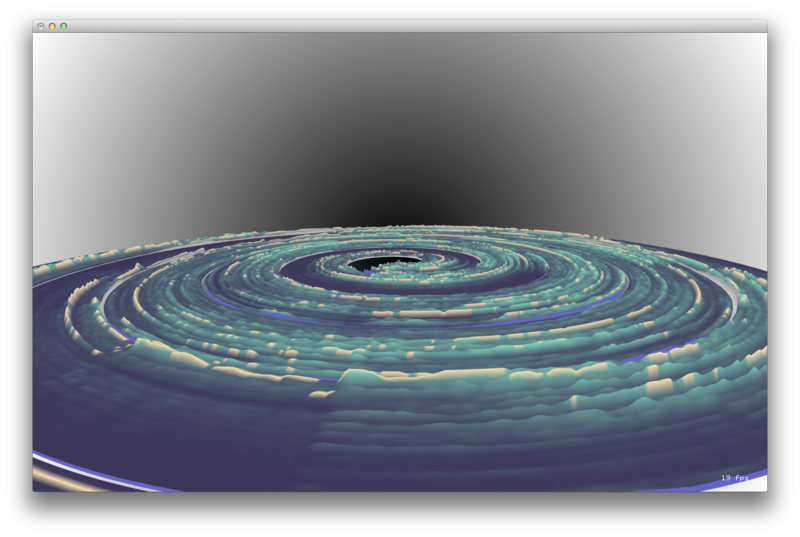 Neal has just released an open source application that allows users to use FFT data of songs and music to create 3D models. These models can then be scaled, giving users the chance to both visualize and 3D print their favorite song. The app runs an FFT audio analysis of the sounds coming in and splits out the intensity of different frequencies. This means that the analysis can separate cymbals from guitars from bass. Once the audio is analyzed, then the user can explore making a physical model of the song. To the right is the high end of sounds; to the left is the low/bass end. The loudest frequency is marked by red and orange, while white to black shows the relative volume intensity through time. To make the object more coarse and fine, you can adjust the number of frequency bands the app is looking at. Now, all Neal needs is musicians with whom to test out the technology. So far, he’s only 3D printed a couple of models about the size of a coffee cup, but he hopes to be able to do larger scale models eventually. If you are a musician who wants to 3D model and print your songs, Neal encourages you to check out his website and get in touch with him. Guitars. 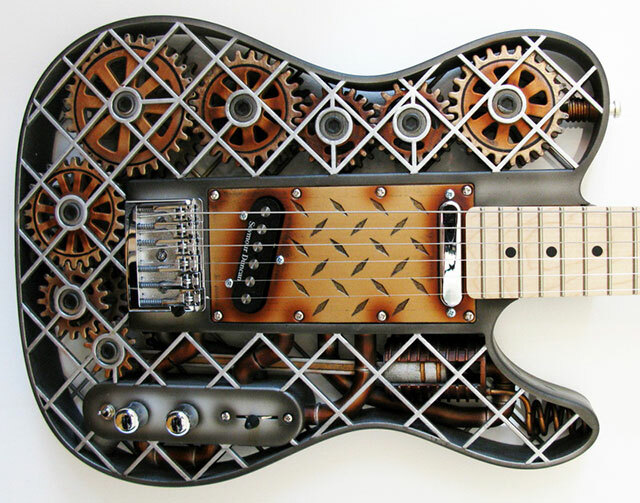 Has ever a sexier musical instrument been conceived? We hug them close to us, ergonomically crafted to reverberate close to our heart. No wonder we fall in love with them. Now, materials and manufacturing breakthroughs are enabling ever more innovative designs to be brought to fruition. 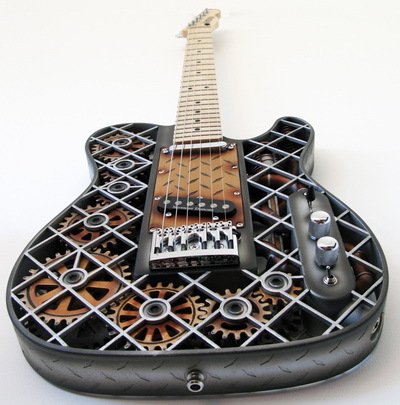 This awesome 3D-printed ODD steam-punk telecaster by Olaf Diegel for example. But regarding the design, steam-punk is a fascinating, and cool, genre. It’s also pretty analogous to 3D Printing: the mix and mash of old and new styles of making to produce something that stands out as uniquely identifiable. Seymour Duncan creates some of the most renown pickups in the business, it’s great to see them in the specifications (see below). The Schaler Bridge will also be very sturdy and aid resonance. A maple body, neck and fretboard is unusual to see, but potentially a harmonous addiction to the Duraform outer body, again, the proof will be in the hearing of this. 22 frets give the guitarist a scale reach in standard tuning from bass E to high D four octaves up. I’m a fan of 24 fret E to E guitars myself, but, this is a telecaster, one of the most famous and iconic guitar designs in history, sister of the world famous stratocaster originally branded by Fender. Also noteworthy is that the Steampunk paint job was accomplished by New Zealand airbrush artist Ron van Dam. To be honest, I love this design. I have yet to have a play, so can make no vouches for sound quality, but the specifications are impressive. If you end up having a jam with this wonder, why not drop us a comment in the comment’s section at the base of this webpage! Regardless of how you feel about eating 3D printed food, and no matter how much everyone wants the r—-ator from Star Trek, PankcakeBot is showing that there is serious interest in making and eating 3D printed food. PancakeBot’s Kickstarter campaign has 29 days left to go, and is already $37,778 past it’s $50,000 goal, which is great news for 3D printing food evangelists, and those looking to give it a shot at home or in their restaurants. I do know that writing this article is making me want pancakes. Miguel Valenzuela had what most people would consider to be a pipe dream, which was to make a “Pancake Machine” out of LEGOs for his two young daughters. Apparently, while he was reading Make magazine one day, his oldest daughter Lily asked him what he was reading. He said to her, “I am reading about a guy that made a pancake stamping machine out of LEGO.” This meant a lot more to Lily, who immediately turned to her little sister, Maia, saying, “Papa’s going to build a Pancake Machine out of LEGO!” Well, Miguel couldn’t let them down, so PancakeBot was born. The PancakeBot generated interest wherever Miguel brought it for display, including a World Maker Faire in New York. 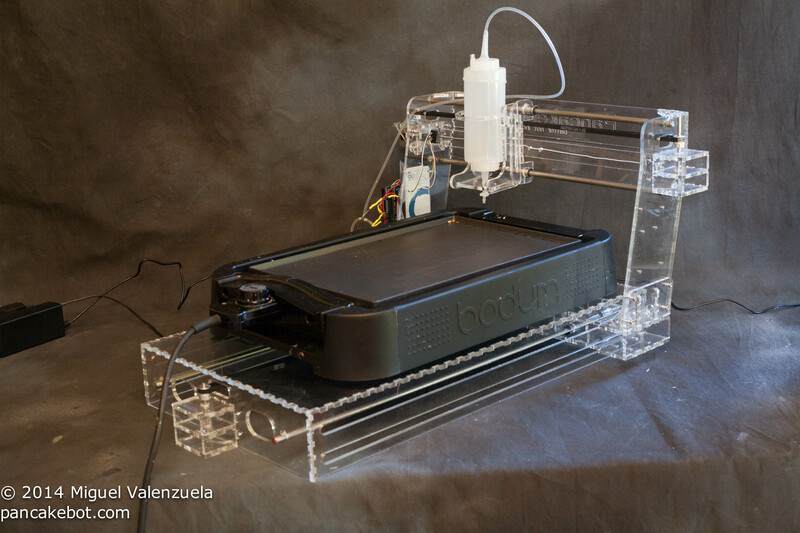 In 2014, Miguel further iterated his designs and created an acrylic version that was shown at both the San Mateo Maker Faire and the White House Maker Faire. Now, it’s a winner on Kickstarter, and Miguel couldn’t be more excited and humbled by the response. I’m now going to make pancakes for dinner. Head over to the Kickstarter page for more info! 3D Systems has long been a partner of the Smithsonian Institution. The two organizations have collaborated on a number of different projects to bring otherwise hidden historical treasures, too old and delicate for public display, out into the light by using 3D digital technologies such as 3D scanning and 3D printing. Early last year 3DPI reported on the work of Nick Pyenson, an experienced paleobiologist and the Curator of Fossil Marine Mammals at the Smithsonian’s National Museum of Natural History. 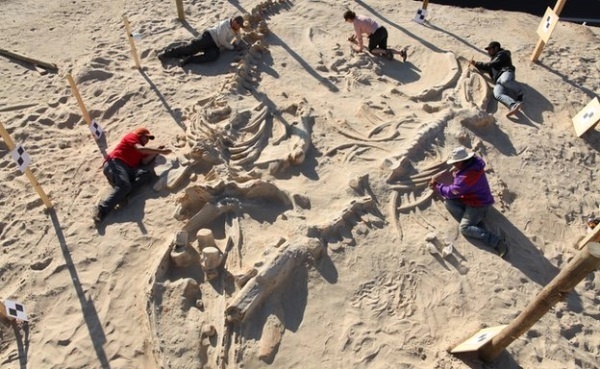 Nick’s excavation of one of the largest fossil finds in Chile, which uncovered the skeletal remains of dozens of whales, has lead to the largest 3D printed joint-venture between 3D Systems and the Smithsonian to date. Indeed, the end of last week saw the first major 3D printed piece for the Smithsonian Institution installed and on display at the National Museum of Natural History along with a showcasing of different 3D printing and scanning technologies. The installation is a 3D printed replica a prehistoric whale fossil that is 20 feet in length, which, according to both parties, means that the prints are the largest existing of their kind. The whale fossils have been finished and mounted to replicate the way they were discovered in the desert. This whale fossil is the just first of many planned 3D heritage projects that the Smithsonian will undertake during its multi-year partnership with 3DS. When I first picked up a toy melodica, I was hooked. It only cost me £20, it was easy to play, and so small I could take it anywhere. I decided to devote a few years to it, and see if I could discover its full potential. At first it was great fun, and quite a novelty to be playing a toy instrument to a high standard. But it had its drawbacks. You couldn’t play fast melodies without some of the notes dropping out, and the tone was so shrill, I felt sorry for anyone sitting next to me. But perhaps worse of all, I found it difficult to be taken seriously at music sessions when I pulled out a bright plastic instrument which was ultimately designed to appeal to kids. I was ready for a professional melodica, but there wasn’t anything out there. These days, 3D printing has become quite a popular method for executing one’s designs, due to the plethora of introductory 3D modeling platforms available and the prototyping ease with which the technology offers. Naturally, then, Banarsë took to learning some CAD software and putting his ideas into the physical world with 3D printing. 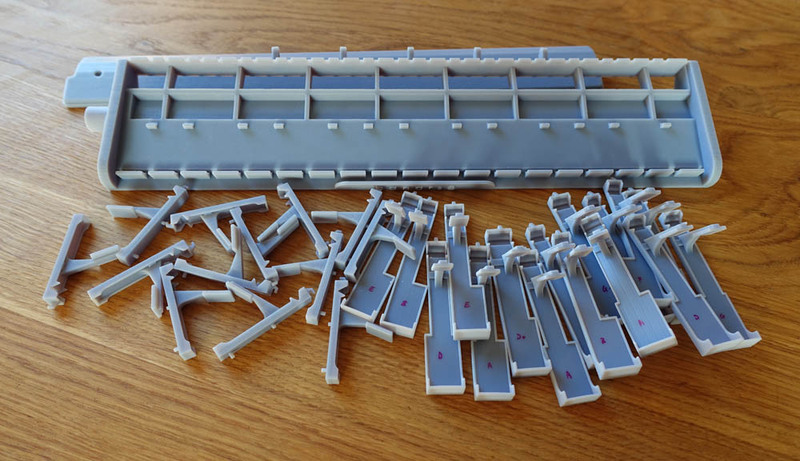 To begin with, Banarsë disassembled his own melodica to see all of its parts and replicate them digitally. He tells me, “[Once] it existed in virtual reality, I could make all the changes I needed to create my dream instrument. I wanted something that sounded as good as any other professional instrument, with a clear tone, and I also wanted it to look a bit special, something I could be proud of.” The result was a large 40 cm-long frame and 32 individual keys that the musician-turned-digital-artist would need to bring into the physical world and, for that, he’d need a 3D printer. Banarsë opted for a Flashforge Creator Pro, thinking that he’d print the frame in sections and glue them together, but, as soon as he began printing out the keys, he realized that a desktop machine wouldn’t be accurate enough for his instrument. He then turned to local 3D printing service bureau 3D Alchemy, which printed the instrument with UV curable resin on a Stratasys Objet Eden 500V. 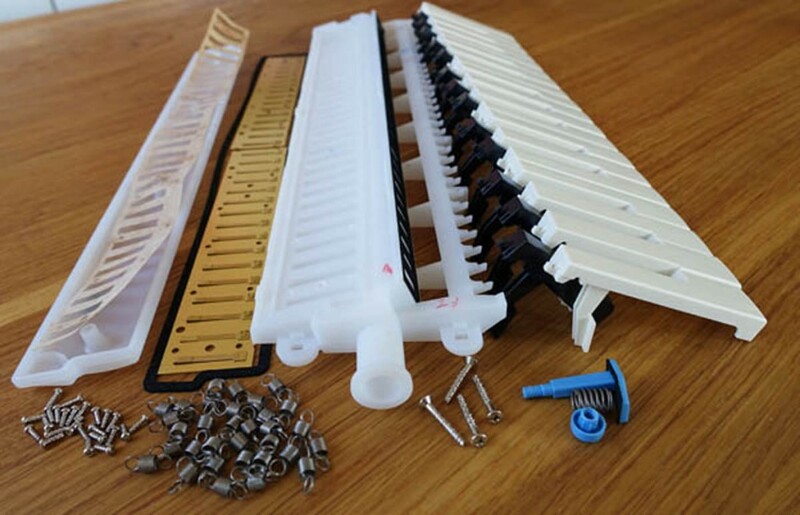 Unfortunately, as beautiful and fine as Eden prints might be, they are more suitable to prototypes than for end-use objects and the composer explains that “once the melodica was assembled, the keys began bending under the pressure of the springs I was using to keep them in place. It seemed my design and application didn’t suite the properties of the material.” Giving him a refund, 3D Alchemy decided to re-cure the frame, hoping to make it stronger. 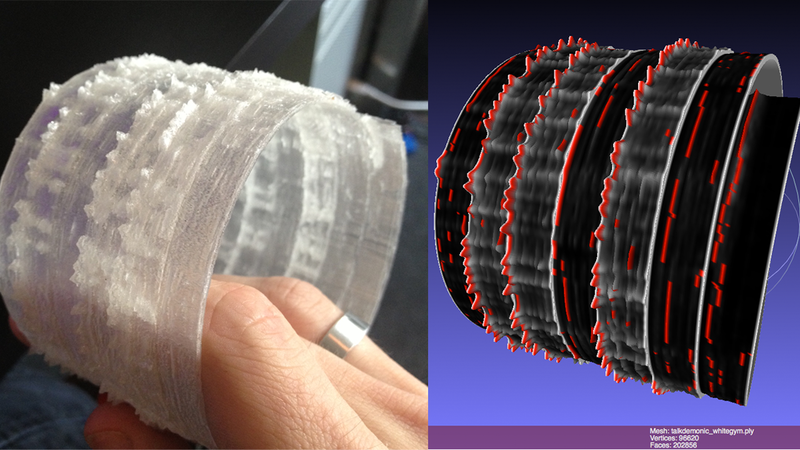 In the mean time, Banarsë began exploring yet another 3D printing option, 3D printing mega-provider Shapeways. He ordered his melodica parts in Nylon 12 (strong and flexible) and, though the frame, cured by 3D Alchemy, worked at first, the artist tells me, “I was disappointed to find that the resin frame began to warp under the pressure of the springs, just as the keys had earlier.” Seeing the strength of the Nylon 12 keys, Banarsë decided to print the 40 cm frame in Nylon, too, which, the artist points out, is printed by the service provider on an EOS Formiga P 100 selective laser sintering machine. Banarsë explains, however, that, as a woodwind instrument, a melodica needs to be airtight and watertight and, because Nylon 12 is porous, he’d initially been averse to using the material. To get around this obstacle and take advantage of the strength offered by Nylon, the artist coated his print in acrylic sealant, before painting and varnishing it. Soon, he had a professional melodica on his hands, but, to get it looking like one, he applied some clever design elements to give it an organic appearance. He tells me, “So I carefully shaped some wood to fit on top of the black keys, and made some end pieces to give the instrument a traditional feel. I also stripped the ivory from some old piano keys to recreate the touch of a quality instrument. And I’m delighted with the result. I finally have a musical instrument that I can take out and play at professional concerts and recordings, and it looks just as good as it sounds.” To hear how great it sounds, check out the video below. The entire process was a long and arduous one that began last July and just finished up this month. The work put into it, though, is obvious and the project demonstrates just what is and what isn’t possible with 3D printing, while illustrating which technologies are appropriate for which applications. 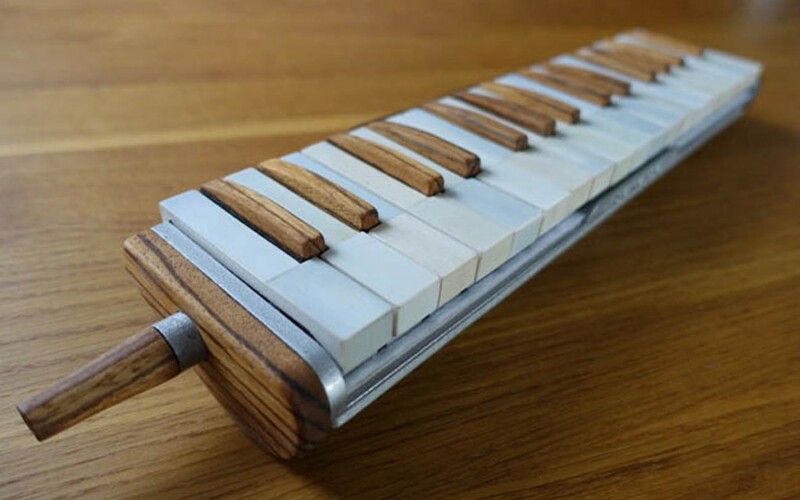 Whether or not you’ll be able to get your own custom melodica from the instrument maker is still up in the air (no matter how badly I want one!). He says, “I really need to test this instrument out long term, to make sure everything continues working properly, before I’d consider making them for anyone else. Working on this melodica has generated a lot more ideas that I’d like to explore, so I’ll probably spend some time making more prototypes. That’s the beauty of 3D printing, there’s no limit to what you can create!” You may not be able to get your own at the moment, but you can follow along with his detailed project over at Melodicaworld.com here. Now, Daren Banarsë has a nice looking and sounding melodica that he can use in all of his musical endeavors, which include composing music and creating “musical sculptures” under the pseudonym Troy Banarzi. If you recognize him from the video above, it may be because he was a former lecturer at Goldsmiths College and has worked with the Rambert Dance Company. And if his music sounds familiar, it may be that you heard it at Somerset House or the Apprentice, Top Gear, Horizon and Coast.